National Institute of Advanced Industrial Science and Technology (AIST), Osaka, Japan. Behaviour of excited Ru(bpy) bound to the surface of water-soluble single-walled carbon nanotubes on addition of other cations have been investigated by measuring Ru(bpy) luminescence. In contrast to what was observed with a solution containing rod-like aggregation particles of Nafion, we found that Ru(bpy) has a stronger attraction than that of other cations to the sulfonic groups on the carbon nanotubes. Such a difference is attributed to the unique micro-environmental characteristics of the molecular assemblies. The photochemical properties of tris(2,2’-bipyridine) ruthenium(II) dichloride (Ru(bpy) ) and related photosensitizers have been subjected to various investigations from the viewpoint of solar energy conversion [1-10]. The electron transfer phenomena of these sensitizers in the excited state have been studied in detail both in bulk and heterogeneous systems [1,4,6-10]. It is important to elucidate the nature of these systems as microenvironments in which the photoinduced electron transfer reaction processes occur. In a previous study [8,9], we demonstrated luminescence quenching in Ru(bpy) -methyl viologen dichloride (MV2+) systems in an ethanol containing Nafion ionomer. Rod-like aggregation particles are found in the Nafion ionomer solutions because of the hydrophobic interactions of fluorocarbon backbones. Side chains containing sulfonic groups are located near the surface of the rod [11,12]. In this system, both Ru(bpy) and MV2+ are cationic; therefore they interact with the anionic surface of the rod-like aggregation particles. A remarkable enhancement in quenching is observed when both Ru(bpy) and MV2+ are adsorbed on the rod-like aggregation particles. The luminescence is restored with further addition of MV2+, because Ru(bpy) appears to be released into the bulk solution. The released Ru(bpy) ions undergo simple luminescence quenching in the bulk solution. We also reported an interaction between Ru(bpy) and a water-soluble single-walled carbon nanotube (SWCNT) . The solubility of the SWCNT in water is secured by poly(m-aminobenzene sulfonic acid) (PABS) covalently bonded to the SWCNT. The molecular weight of the PABS is 400 - 800, which indicates that each PABS molecule contains on an average three sulfonic groups. Cationic Ru(bpy) is adsorbed on each sulfonic group, and the luminescence of Ru(bpy) at the sulfonic group adjacent to the trunk of the SWCNT is quenched by the mechanism of electron transfer to the SWCNT. On the other hand, two-thirds of Ru(bpy) is not quenched, because the SWCNT is remote for electron transfer. In the present study, we analyze the behaviour of Ru(bpy) on the surface of the water-soluble SWCNTs on adding other cations. The results of these investigations will contribute to the improvement of organic photovoltaic solar cells. Ru(bpy) (Tokyo Kasei), MV2+ (Tokyo Kasei), sodium chloride and calcium dichloride were used as received. The SWCNT (Cat. No. 639230) was obtained from Sigma-Aldrich Co . The SWCNT (10 mg) was sonicated in 1 dm3 of water for 2 h. The suspension was filtered through a 1-μm-pore-size membrane, and the greenishgrey filtrate was used for the mother liquor to dissolve the luminescent Ru(bpy) and the additives. In the mother liquor, the concentration of the sulfonic group on the surface of the dissolved SWCNT was 7.5 × 10–6 mol/dm3. Luminescence spectra were measured using a fluorescence spectrometer (Perkin Elmer LS50B). All aqueous solutions for the luminescence measurement were deoxygenized by flushing with Ar gas for 20 min. 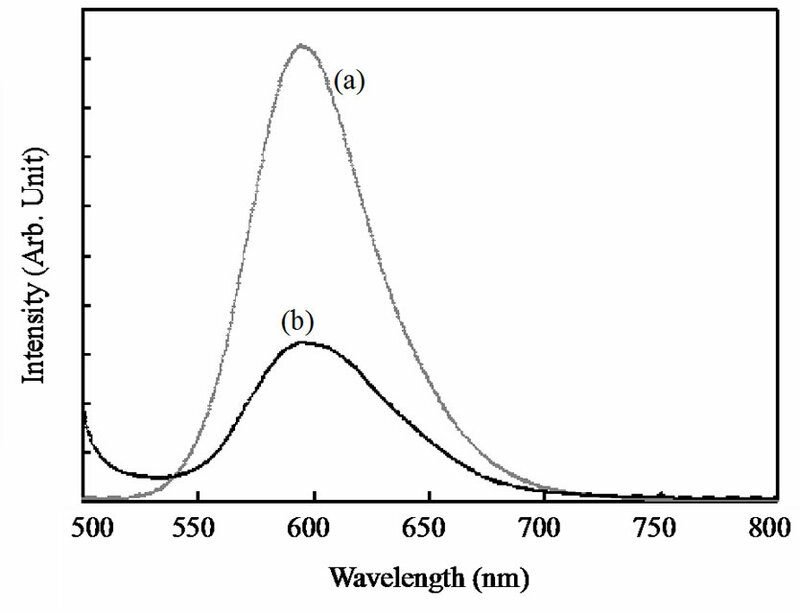 Luminescence spectra of Ru(bpy) are shown in Figure 1. The intensity of luminescence from the aqueous solution with the SWCNT ([sulfonic group] = 5 × 10–6 mol/dm3) is lower than that without the SWCNT. The excitation beam and luminescence in the sample solution are absorbed by the SWCNTs, which reduces the luminescence intensity. In addition, a part of the luminescence of Ru(bpy) is quenched by the associated SWCNT. As shown in Figure 1, the concentration of Ru(bpy) is 5 × 10–6 mol/dm3 and all Ru(bpy) ions are adsorbed to the sulfonic groups of the SWCNTs. Hence the luminescence intensity is reduced to two-thirds of that already reduced by SWCNT absorption. Figure 1. Steady-state luminescence spectra of Ru(bpy) (a) in water and (b) in water containing SWCNTs. [Ru(bpy) ] = 5 × 10–6 mol/dm3. [sulfonic group] on SWCNTs = 5 × 10–6 mol/dm3. Figure 2. 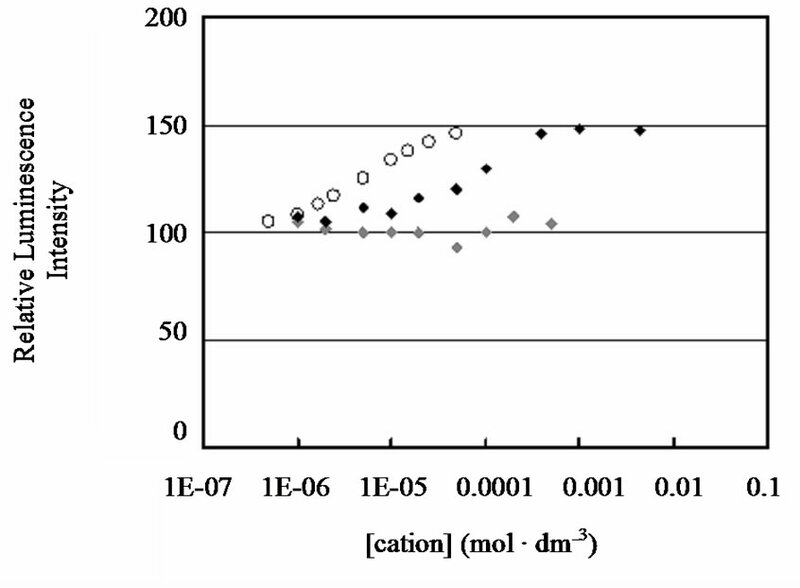 Luminescence intensity versus concentration of the added cation. Added cation: (◆) Na+; (◆) Ca2+. The simulated intensity is plotted with ○ (see text). The luminescence intensity of the solution without added cation is normalized to 100.
now cancelled, and the luminescence of the corresponding Ru(bpy) is recovered. As the ratio of Ru(bpy) adjacent to the SWCNT is one-third of the total, the luminescence intensity increases correspondingly. In a previous study [8,9], we reported that Ru(bpy) ions adsorb onto the sulfonic groups on the rod-like aggregation particles of Nafion and that Ru(bpy) is released into the bulk solution by the addition of MV2+. In this case, the concentrations of the sulfonic groups and Ru(bpy) are 3 × 10–4 mol/dm3 and 6 × 10–5 mol/dm3, respectively. 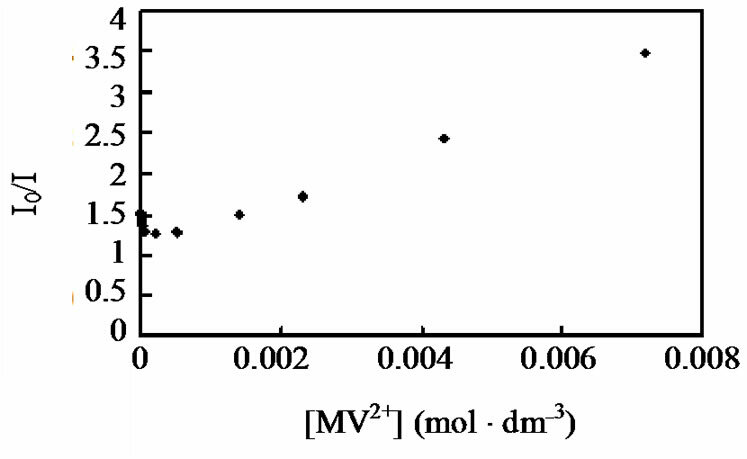 When 3 × 10–4 mol/dm3 of MV2+ is added to this solution, luminescence measurements suggest that Ru(bpy) ions are mostly released into the bulk solution. For the Nafion aggregation particles, the propensity to adsorb Ru(bpy) or MV2+ is not distinguished. In case of the Ru(bpy) -cation system in the present SWCNT solution, the luminescence intensity could be simulated assuming that there is no selectivity for adsorption between Ru(bpy) and the added cation. As is plotted with open circles in Figure 2, the luminescence intensity of Ru(bpy) increases with the concentration of the added cation (See Appendix). 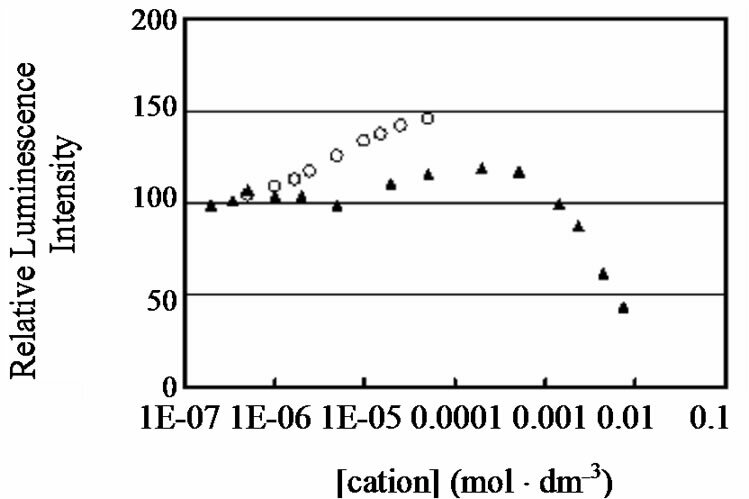 The intensity at the concentration of 5 × 10–5 mol/dm3 is simulated to be 1.455 times greater than that in the absence of the cation. In practice, 4 × 10–4 mol/dm3 of Ca2+ releases almost all Ru(bpy) , thereby increasing the luminescence intensity by a factor of 1.5. The discrepancy between the simulated values and the empirical results with Ca2+ and Na+ suggests that the adsorption affinity of Ru(bpy) for the SWCNT sulfonic groups is much higher than that of Ca2+, and that Na+ no longer replaces Ru(bpy) . Moreover, further addition of Ca2+ does not influence the luminescence intensity of Ru(bpy) because Ca2+ is not a quencher for Ru(bpy) . Figure 3. (a) Luminescence intensity versus the concentration of added MV2+ (▲). The simulated intensity is plotted with ○ (see text). The luminescence intensity of the solution without MV2+ is normalized to 100; (b) Stern-Volmer-type plot of Luminescence intensity versus the concentration of added MV2+ (◆). A hypothetical luminescence intensity of Ru(bpy) in the absence of MV2+ is defined as I0, where the excitation beam and luminescence in the sample solution are absorbed by the SWCNT, but the luminescence of Ru(bpy) is not quenched by the SWCNT. This hypothetical intensity is indicated as 150 in Figure 3(a). demonstrates no luminescence quenching ability. Each sulfonic group of the PABS covalently attached to the SWCNT seems to be remote from the others, and adsorbed MV2+ cannot quench the luminescence of Ru(bpy) adsorbed on remote sulfonic groups. Figure 3(a) also suggests that the relative adsorption affinity of MV2+ for the sulfonic groups seems to be quite similar to that of Ca2+. At a high concentration of MV2+, Ru(bpy) ions are released into the bulk solution. In the bulk solution, the concentration of MV2+ is already sufficient to quench the luminescence of Ru(bpy) . The luminescence decreased with an increasing concentration of MV2+ as a result of a simple Stern-Volmer type of luminescence quenching (Figure 3(b)). The low affinity of Na+ ion adsorption onto the sulfonic groups of the SWCNTs, compared with that of Ru(bpy) , can be explained on the basis of the valence. Single-charged cations have a lower attraction to anions than double-charged cations. On the other hand, Ru(bpy) , MV2+ and Ca2+ have a 2+ valence. Although the affinity of Ru(bpy) and MV2+ to the sulfonic groups on the Nafion aggregate is identical, Ru(bpy) has a signifycantly greater affinity to the sulfonic groups on the SWCNTs than MV2+ or Ca2+. This enhanced attraction between Ru(bpy) and the sulfonic groups of PABS on the surface of SWCNTs is expected to be assisted by van der Waal’s attractive forces between the benzene nucleus of PABS and the 2,2’-bipyridine ligand of the cationic complex. In the present study, we have observed the luminescence intensity of Ru(bpy) on the surface of water-soluble SWCNTs on addition of other cations. A comparison with solutions containing the rod-like aggregation particles of Nafion highlights the different micro-environmental characteristics of these molecular assemblies as mediums for photochemical electron transfer reactions. The accumulation of such information would be applicable to the design of high-performance organic photovoltaic solar cells. H. Shioyama, A. Takami and N. Mataga, “Comparative Studies of Anionic Molecular Assemblies as Mediums for Electron Transfer Quenching of Excited [Ru(bpy)3]2+ by Cationic Quenchers,” Bulletin of the Chemical Society of Japan, Vo. 58, No. 3, 1985, pp. 1029-1032. 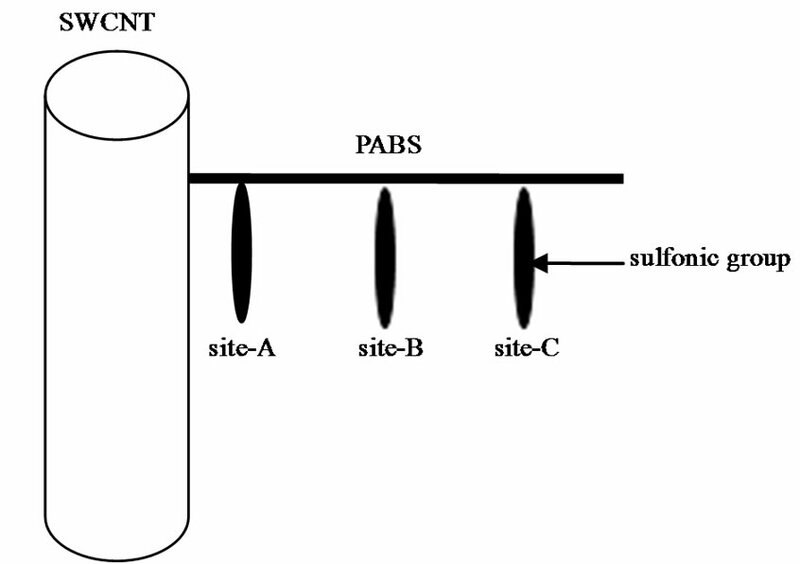 As shown in Figure 1A, each PABS has an average of three sulfonic groups and is covalently bonded to the SWCNT. As the SWCNT is an electron acceptor, the luminescence from excited Ru(bpy) adsorbed on the sulfonic groups adjacent to the SWCNT (site-A) is quenched . On adding other cations to a solution of Ru(bpy) (5 × 10–6 mol/dm3) and SWCNTs (the concentration of the sulfonic group is 5 × 10–6 mol/dm3), Ru(bpy) ions adsorbed on the sulfonic group are released into the bulk solution. In the bulk solution, the luminescence from Ru(bpy) is no longer quenched by the SWCNT. The intensity of the released Ru(bpy) is 1.5 times greater than that of the adsorbed ions. Details of the simulated luminescence intensity are shown in Table 1A. Figure 1A. Schematic illustration of the SWCNT. Ca. one PABS is covalently bonded per 11 carbon atoms of the SWCNT. Table 1A. Simulated luminescence intensity of Ru(bpy) on adding a solution of cations with a hypothetical sulfonic group affinity identical to that of Ru(bpy) . The concentration of SWCNT-associated sulfonic groups is 5 × 10–6 mol/dm3.